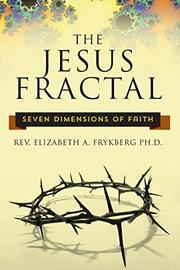 Debut author Frykberg offers a new way of looking at the many aspects of Jesus. “Isolate a piece of a fractal and you see the whole, and vice versa,” the author writes in this clear, engaging treatise. “Observing the whole, you see the image of every constituent part, the minute and infinite reflecting one another.” The specific illustration she gives is cutting open the florets of an ordinary cauliflower; through skillfully controlled elaboration, she proceeds to make this a metaphor for perichoresis—the examination of the three elements of the Trinity and how they’re simultaneously one and separate. In successive chapters, she discusses her conception of the seven dimensions of the titular “Jesus Fractal,” highlighting such aspects as the “Sent into the World Dimension,” the “Love Dimension,” the “Faith Dimension,” and so on. In each case, she examines how Jesus is essential to the dimension while also keeping the larger Trinitarian framework in view—a genuinely impressive rhetorical performance that simply renders complex ideas. Her inviting, illustrative examples are wide-ranging, from the musical Les Misérables to more traditional scriptural exegesis; she writes with equal fluency about the salvation of Jean Valjean and the Gospel of John’s story of Jesus’ conversation with the woman at the well. “Jesus didn’t just talk about the Kingdom of God; Jesus lived the Good News he proclaimed,” she writes, and she frequently returns to this active element of Christianity; it’s front and center in her discussion of the “doing” dimension, in which she reminds readers that choosing one’s life’s work isn’t as important as “choosing to live in accord with God’s will, as Jesus did.” She rounds off each chapter with discussion questions that will be ideal for lively Christian group-study. A refreshing, thought-provoking explication of the tricky Christian concept of the triune God.